My stories are arranged by primary character listings. The dates when each story was written is also listed after the title, should you wish to read them in that order and see how my writing has evolved over the past seven years. Written for a winter 2010 exchange; somehow I'd not posted this until now (July 2011). Post-Ring War, a man of Rohan with more curiosity than many goes to visit the Dwarves who have recently settled in the caves of Helm's Deep. G rating. In honor of my friend Elfscribe's birthday, I wrote her an adult Tolkien story featuring two of her favorite characters, Elladan and Elrohir. I paired them with a relative innocent of Rohan, an OMC named Onthéon, set during the reign of King Brego, the second king of Rohan. Yes, you've read this correctly: I have now written Elf slash, and twincest at that, though it's intimated, not outright. Summary: Onthéon, royal groom of Meduseld under King Brego's rule, has an unforgettable experience when Elladan and Elrohir arrive in Calenardhon under the auspices of having Elladan's horse's foot healed. NOTE: This is slash (M/M) and adult. For the first time ever, I participated in a Tolkien slash exchange. I was given the request of Aragorn/Halbarad, canonical, and high angst. Summary: Halbarad has always known that he and Aragorn wouldn't be together for a lifetime or anything near it, but that doesn't make the actual ending of their discreet relationship any easier. A glimpse into the dynamics of the Chieftain of the Dúnedain and the Ranger who is dearest to his heart. NOTE: This is slash (M/M) and adult. It's also posted here at the Slashy Santa fanfiction site. You can leave reviews there, or email me at my email address listed on my front page. 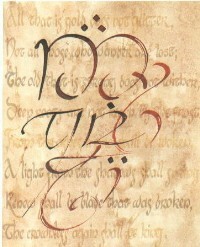 Written for Annmarwalk, another lover of Rohan and her people. Summary: On the longest night of the year, a 16-year-old Théodred learns about precious gifts. R-rating, slash. Théodred/OMC. Written for Jen, a fellow fandom friend for several years and beta extraordinaire. Summary: When Aragorn struggled with his thoughts in the Hornburg after the battle at Helm's Deep, he asked another Ranger to accompany him. A vignette of Halbarad's musings on his life and future during a long, uncertain night. Éowyn-centric ficlet written for Cim_Halfling, a fellow fandom friend for several years. Summary: Beauty burrows resolutely in the eye of the beholder. a few thoughts that may have passed through Éowyn's mind while she contemplated the irony of her fate, and those interwoven within it. A story about the lesser- written, earlier-generation marital uniting of Gondor and Rohan: a telling of the lives of Morwen of Lossarnach and Thengel, their family, and those who intersect with it: Ecthelion, Aragorn, Rangers and Marshals. Drama, some angst. Written October-December 2003. 8 Chapters. Now available here as a downloadable pdf! The story that started it all. An 8 year old girl of Rohan unwittingly uncovers a piece of history, but it takes a very unexpected visit from a stranger to give her the clues to discover its source. Inspired by some appendix notes in "Cirion and Eorl" in Unfinished Tales. (begins with "Boar and Steward") A story of Rohan, beginning with Éowyn's childhood and continuing past the War of the Ring, covering around 35 years. Features Éowyn and Frealas, an OFC who is two years Éowyn's senior. Multiple POVs, action, drama, some angst and musings on a possible underground shieldmaiden subculture that might have been revived in Rohan before and during the WR. 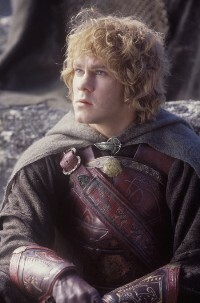 Many scenes focus on ordinary people in Rohan and what their lives were like "off-screen" from the main storylines during Lord of the Rings. written March-July 2003. 20 Chapters. Now available in pdf format for easy reading here! Inspired by some throwaway lines in 'The Black Gate Opens.' A short vignette about one of the nameless lost during the last days of the War of the Ring. A story about Éowyn. Oftentimes it is the simplest gifts that are the most profound. "Where will wants not, a way opens" Éowyn says in The Two Towers. A series of vignettes about Merry and Éowyn, boots, the afterlife, and joy in unlikely friendships. Written for a "religion in Middle Earth" challenge for Parma Eruseen. Getting back to my Ardaverse writing roots, I'm exploring Éowyn and Faramir's relationship from their first meeting until betrothal; at least that's the concept. Alternating POVs between Éowyn and Faramir, with Merry, of course, making several appearances. 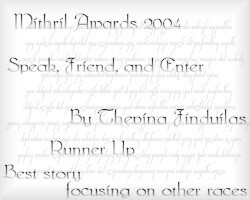 I was the 2006 and 2005 MEFA's Second Place winner for author writing about Dwarves! Just don't have a new icon for this year, but I'm so very pleased. Instead I'm using one of my LJ icons that I made. 021. Friends 022. Enemies. 023. Lovers. 024. Family. 025. Strangers. 026. Teammates. 027. Parents 028. Children. 029. Birth. 030. Death. 041. Shapes. 042. Triangle. 043. Square. 044. Circle. Moon. 056. Breakfast 057. Lunch. 058. Dinner. 059. Food. 060. Drink. More about this fic below the table. 091. Birthday. 092. Christmas. 093. Thanksgiving 094. Independence. 095. New Year. I signed up for a Tolkien genfic LJ challenge with a theme of 'believe it or not' and the prompt of "dim". I went with it in a different way than some people might have thought; features several original character Dwarves and a Hobbit-era aged Gimli. G rating. 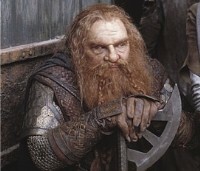 I'm participating in Fanfic 100, and I chose Gimli as my character. Each square in the table is a prompt, and ultimately I'll have 100 Gimli-centric fics/ficlets. I've started with previously-completed works, and the links are to outside archives where you can opt to leave a review if so inspired. The newest stories are prompt #36— Smell, #56— Breakfast, and #80— Why?. #85 (She) is Antiphon to Light, and has won a couple of awards. It's also my first and thus far, only story to have been translated! You can find it translated into German here as "Ode an das Licht". Fathers and sons: oftentimes it's a strong bond between the two. So is it any wonder after Merry and Legolas return from Cair Andros prior to King Elessar's coronation, that Gimli and Legolas would end up in a heated argument about Glóin and Thranduil? Humor. A tale of Dwarves and Elves, of artisans, the creation of the great West-Gate at Khazad-dum, and unlikely authors. Both post-WR and Second Age; Legolas and Gimli, and Narvi and Celebrimbor. Written for the "Authors of Middle- Earth" challenge at Henneth-Annûn. Humor, but with a serious nod to Elvish/Dwarvish relations during their heyday as well as musings on Dwarvish culture in general. Now also available in pdf form here, for your easy reading pleasure. An evening in Fangorn Forest when things hidden come to light. Legolas tries smoking and unwittingly discovers that he doesn't know as much about his Dwarvish friend as he thought. That he writes poetry, for instance. A vignette from Gimli's point of view on the field of the Morannon after the last battle, looking for Pippin. Written for Oshun for the 2009 Ardor in August. Silmarillion-era, Elves, Men and slash. Explicit. Pairing: Amras/OMC Elf, Amras/OMC Elf/OMC Man. Summary: With the first coming of Men into east Beleriand, the lives of the Elves are changed. For Amras, his lover, and Amrod's squire, this change becomes unexpectedly personal. Denethor at age 13. What life might have been like for the far-seeing son of the Steward Ecthelion over an impressionable week in summer. I was given a character, a title, and one line of dialogue. Drabbles are 100 words, exactly. A set of vignettes which all take place during one particularly challenging day during the War of the Ring, March 14, 3019. The vignettes are based around the monastic services of the hours, seven in all, from 3:15 a.m. to 7:30 p.m; additionally, each vignette focuses on one of the senses- taste, touch, etc. Some are well-known characters in well-known scenarios, others are more obscure. Four vignettes spanning three ages of Middle-earth, multiple geographies and races, and several points of view. What binds them together: the night sky above, whether starry or clouded, and a sparkling gem that resists disappearing into the mists of time. Also now available here for your easy reading pleasure. so the appendix doesn't say that Merry ever has a daughter. But it doesn't say that he didn't. Or that she might not have been named for a certain woman of Rohan. This is a short one, sweeter than I usually write. Dedicated to my great stepfather. a quickie story set during The Hobbit. Dedicated to my own Sam. Short, somewhat angsty story of a drum maker escaping from a bad family situation in Pelargir. Some musings I wrote down in the summer of 2002 while visiting my grandparents. Originally posted one a day at TheOneRing.net. While nursing her baby Faramir, Finduilas reflects on a relationship from her past. Adult rating for somewhat explicit sexual content. F/F and M/F. Not gratuitous. An experimental story. A retelling of the relationship of Tuor and Ulmo, from Ulmo's point of view. Character biography of Turgon, 24th Ruling Steward of Gondor. Father of Ecthelion and grandfather to Denethor, not many people write about him, but he is in my story "A House Divided" and I figured he could use his own bio to distinguish him from the Elf Turgon in the First Age who features in many more fanfiction stories. A character biography of Glóin, one of the group of Thorin & Co., and father to Gimli, Elf-friend. A biographical sketch of Thengel, 16th King of the Mark, and his wife, Morwen of Lossarnach. Also includes brief commentary involving Theoden, Aragorn/Thorongil and Ecthelion II. A character biography on Éowyn, one of the most fleshed-out female characters within the Lord of the Rings trilogy. Bio sketch of Middle-earth's only red-haired twins, Amrod and Amras, the last two sons of Fëanor. This is an essay written for a class on Fan Participation in Media and Culture. How do the members of Henneth-Annun see themselves? A paper outlining the responses to a survey taken in November of 2003 which reveals the many disparate feelings toward and against different aspects of participation in the archive. The current Tolkien online fanfiction community, like most fanfiction communities, is one in which most of the writers are women, many of whom are writing in male-character dominated environments. The Tolkien online fanfiction community has grown exponentially over the past 18 months since the release of the Peter Jackson films of The Lord of the Rings. Is the gender of the writers of current Tolkien fanfiction relevant to their desire to write new stories set within Middle-earth? The author, who is both a woman and a Tolkien fan, wondered about this, and decided to ask the writers themselves. She posted a survey to the current writers, asking questions relating to why they write Tolkien fanfiction and their relationship, if any, to the women characters in Tolkien's works. This paper examines the 62 replies that were received over a two week time period in February, 2003. The results are complex and inconclusive, though many responses are illustrative of the way this community sees itself in relationship to Tolkien's writings, each other, and the world at large. written February-March 2003. It was in writing this paper that I became inspired to write fanfiction myself. A paper analyzing a Remus/Sirius story written by Casira M. for the "Fan Participation in Media and Culture" course I sat in on. A short poem from the "Star-watcher" king of Numenor. Originally written for a poetry challenge at Parma Eruseen. A different approach to Mother's Day. Short, darkly humorous poem written for the Mother's Day challenge at Parma Eruseen. Inspired by my friend Elaine, who, when we were discussing Tolkien over breakfast, asked, "Where are all the mothers?"